Landing pages are a crucial part of a successful inbound marketing strategy. Without them prospects remain just that, prospective or future customers. Potential customers don’t boost ROI in any way. You need to find a way of turning all the people who’re interested in what you do into real customers. Whether they expressed interest through a paid ad or an email campaign, you need to take them to a page that gets them into your funnel. That’s where landing pages come in. They turn interest into action and action into revenue, eventually. A landing page is a stand-alone web page where a prospective customer lands after expressing interest in a campaign made that they ‘land’ from. Its sole purpose is to convert a visitor into a lead or customer by convincing them to take one specific action. The main reason why you need landing pages is they significantly boost conversions. Plain and simple. Unlike other online pages they’re uncluttered. This graphic from Unbounce demonstrates the difference. Consider the above diagram, which shows a homepage (left) and a landing page (right). Orange represents links. The Homepage has 43 links, and the landing page has only 1. Which page would convert better? It’s a no-brainer—the landing page wins hands down. Research has proven it again and again. If you give people too many options they suffer from paralysis by analysis and end up not making a choice at all. Landing pages allow marketers to collect valuable information about their leads. This info can then be used to follow up the potential and market better overall. For a landing page to work it needs traffic. That traffic comes from other channels like social media, paid advertising, and email. Let’s now get into the anatomy of a high converting landing page. Landing pages have only one goal: to convert prospects into leads by making one solid offer. Anything and everything else that detracts from this overarching goal must be ruthlessly cut off. A common mistake brands make with their landing pages is including navigation with options for people to go elsewhere. Don’t give them that chance. Get rid of all navigation so visitors stay on the page. You better take time to craft a good headline. Clear – so that people easily grasp what you’re offering. If you focus on being clever you’ll lose readers fast. Connected – it’s linked to the wording in the source page so there’s a smooth landing for the readers. Specific – it’s especially targeted at the people you are targeting and no-one else. It alienates those who are not a good fit for your offer while attracting those who are. Resonates – it instantly builds a connection with your audience. It makes them warm up to you because they identify with your message. Summative – it aptly sums up the content of the page so visitors know in a flash what they’re in for. Here’s an example of a good headline from Disruptive Marketing. The headline uses a shocking statistic to pinpoint the target audience’s pain point and draw their attention straightaway. As a marketer I’m sure you can identify with the challenge of dismal conversions from paid advertising. Use tried and tested headline formulas to come up with winning headlines. A powerful headline is not enough. It has to be followed by a scintillating subhead that seamlessly ties in to the headline and keeps readers on the page. If there’s disconnect between the headline and the subhead people may be tempted to leave. A good subhead builds on the headline. It shares that little bit more info that draws the reader further down the page. Here is an excellent subhead from Unbounce. The subhead completes the headline. It gives specific details about the course that aren’t in the headline. What’s in it for me? What can you do for me? Answer that question by making an enticing offer. In short, offer anything your audience finds valuable. Words alone are not enough to make people convert. Compliment your verbal offer with relevant images. Our brains are predominantly visual and process images 60,000 times faster than text. Practically speaking, this means the first thing people ‘read’ on your landing page is the picture. Make your image count. The image on the left is not only visually appealing— it dominates the page in a good way and captures the essence of the offer. A word of warning about pictures. Don’t just include an image because it’s lovely. Only use relevant images. Once you’ve pulled your readers through your headline and subhead, it’s time to enumerate the benefits of your offer in the body copy. Use the triple S approach. Make your copy short, sharp, and sweet. Or just list the benefits as bullets. 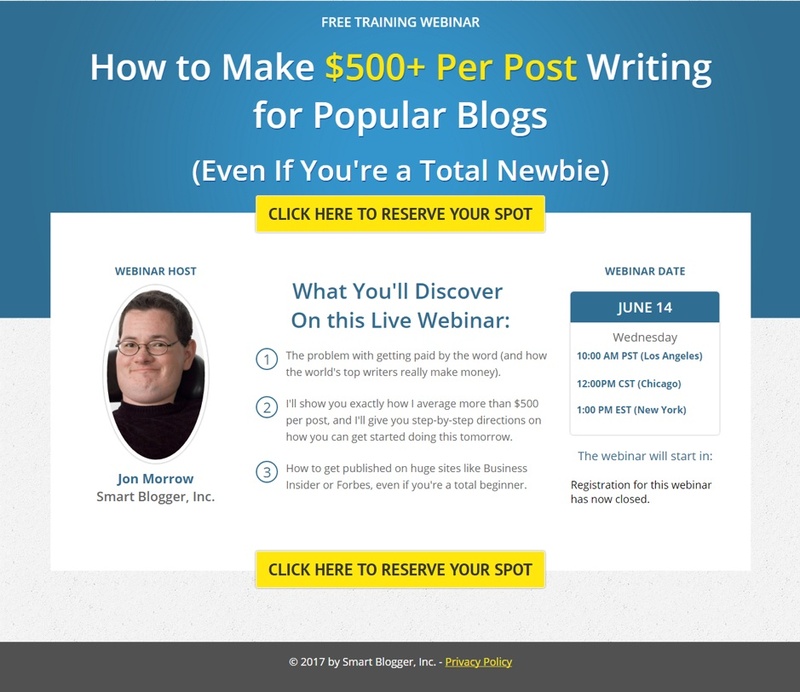 Smartblogger, a blog that teaches bloggers how to make money online, nailed the body copy of their landing page. The three bullets are conversational, precise and convincing. They make clear what the webinar is all about. How much body copy do you need on your landing page? Well, this depends on three components. Awareness: How aware is your prospect about you and your offer? The more aware she is about you and what you do the less copy you need and vice versa. Niche: What works best for your niche? Some niches lend themselves to longer copy while in others shorter copy works best. Complexity: How complicated is the problem you want to solve for the potential customer? The more complex the problem, the more copy you need and vice versa. Bolster your body copy by using social proof. Include reviews and testimonials. According to Search Engine Land, 88% of consumers trust online reviews as much as personal recommendations. To get prospects details and deliver your offer you need a form. Research has shown that the more info you demand, the fewer conversions you get. The reason is simple. Longer forms mean more work for prospects. 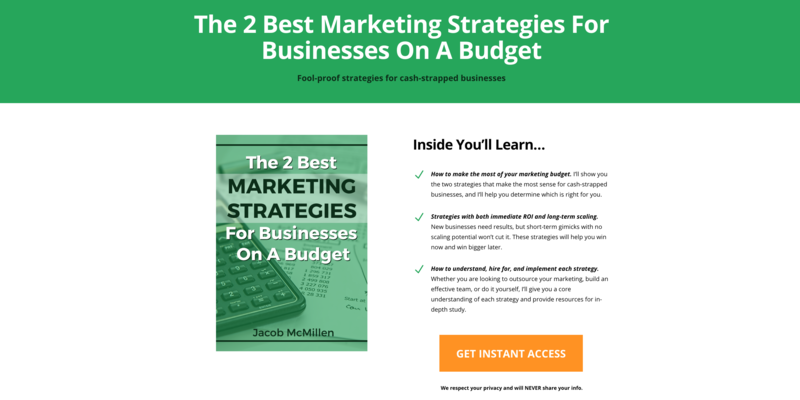 Get the absolute minimum info you need for your campaign. In most cases that’s just the email address and name is enough. You can always get more info later. MaTech revealed that less form fields increase conversions by up to 160%. Push your form high up the page so visitors don’t have to scroll down to see it. Your call-to-action marks the finish line of the conversion race. Nudge prospects over the line through power-packed CTAs. As a general rule avoid using generic words like “submit” or “send”. A study of over 40,000 landing pages by HubSpot showed that conversions nosedived when the word “submit” was used. See the results below. Use specific words that show readers how they’ll benefit from your offer. Lead with a strong verb that prompts action. You can also provoke immediate action by taking advantage of FOMO (Fear Of Missing Out). 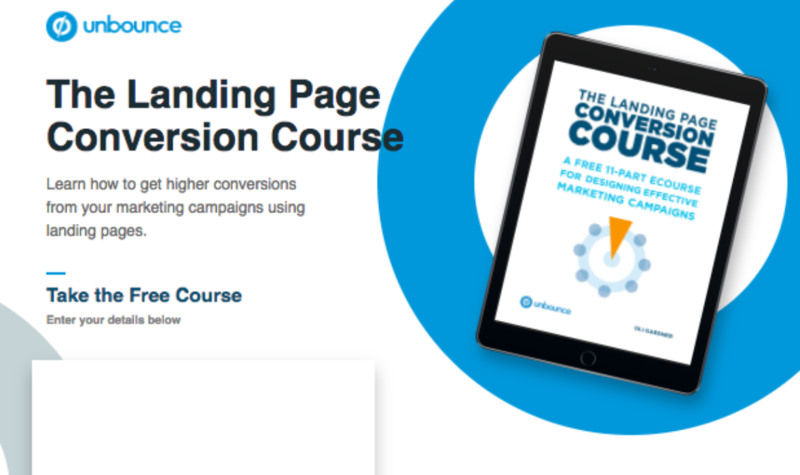 Landing pages are all about conversions. Don’t think you’ve come up with a great one. Test it instead. Run split tests on the different elements of your page. From the headline to the image through to the CTA take guesswork out of your game. Test again and again. Pick the winners, tweak your page. Rinse and repeat and keep improving the page. Pay attention to your analytics as well. Which traffic source has the highest conversions? Drive even more traffic from it. Which one has the worst conversions? Drop it. Don’t let all of the money spent on content creation, website design, paid advertising and more go to waste. Use these tips to build solid landing pages that turn website visitors into leads, and leads into customers. Get landing pages right and you’ll reap the benefits.